These 100 PC White Royal Sundance Smooth covers are designed to look great in both printed and un-printed applications. The 100 PC White Royal Sundance Smooth covers have elegant and glamorous finish yet economical. Acid free, 100 PC White covers are lignin free and are "Green Seal" certified to contain at least 30% recycled materials. All Royal Sundance Smooth binding covers guarantee a high-quality performance for laser and inkjet printers. Check out our huge selection and consider setting your reports, presentations, projects and proposals apart with these 80lb 100 PC White Royal Sundance Smooth binding covers. Transcript: These are Royal Sundance Smooth Covers! The covers are printer friendly as long as your printer can support the thickness. And speaking of thicknesses, they come in an 80 pound weight and a 100 pound variety. 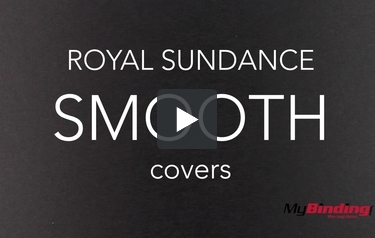 These are Royal Sundance Smooth Covers!